The Property Is a 2 Bedroom 1 Bath Garden Apartment With Backyard. Beautiful 2 bedroom private garden apartment in Brooklyn. Private entrance, open living room space and kitchen. Two bedrooms with great closets with queen size & full size beds. Additional queen size pull-out sofa for two more guest. Accommodates 5 people. Private backyard for BBQ gathering during the summer months. Desk area with WiFi and cable TV available in apartment. Central AC to stay cool all summer long. Washer and dryer on premise for guest deciding to stay longer than a week's vacation. 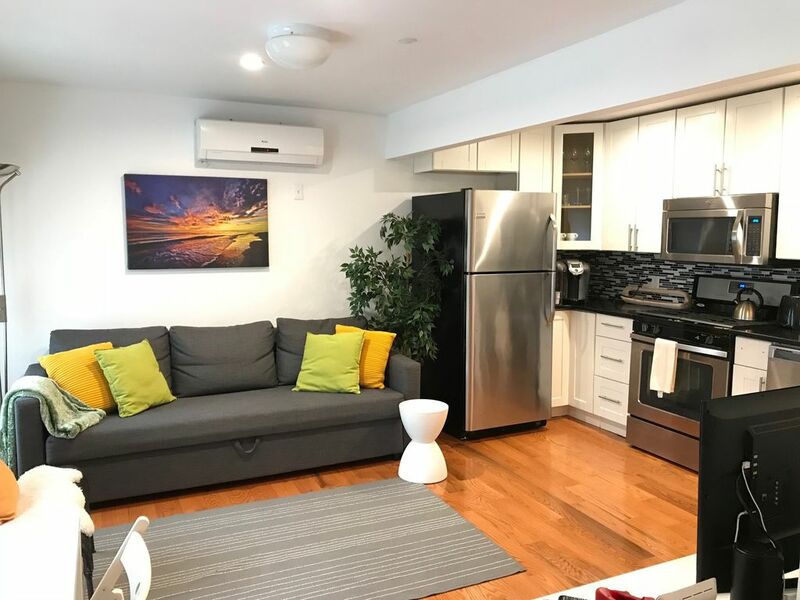 Great Brooklyn location close to the train (5 min walk) and NYC (10 min to downtown NYC and 30 min to mid-town), all the best restaurants, other Brooklyn neighborhoods, Parks, Museums and Theaters. Bathroom has bath towels, hand towels, and wash cloths. Includes toilet tissue, bath soap, and hand soap. Free internet and free Netflix. Standard spices (e.g., salt, pepper, thyme, oregano, sugar). Dining table seats four comfortable with 4 chairs. We spent a wonderful week in this immaculate apartment. The subway is a five minute walk, there is a very nice grocery store about ten minutes away, and the neighborhood was friendly and quiet. Parking was pretty easy -although you have to move your car at certain times, it wasn’t a problem. We usually stay in hotels either in Brooklyn or Manhattan, but this was a lovely alternative and much more relaxing. We would love to stay here again! We thoroughly enjoyed our stay at Nicky and Darau's place in Brooklyn. It was cozy, clean and very conveniently located to get into Manhattan. Nicky was very helpful and always quick to offer suggestions and help when needed. Thank you Nicky! Location: We stayed for a 5 days, Tuesday through Saturday. We were able to both check in early and stash our stuff until a late flight, which was very kind! Nicky was very helpful with local info! The good grocery store is close enough to be a fairly easy walk, unless you get more than a couple of bags - a little collapsible grocery cart in the closet might help! The A & C lines are a very easy walk away, which will get you into Manhattan in no time at all. Apartment: The little backyard garden has a ton of potential to be a charming space! The beds are comfortable and the linens are very nice, there's good water pressure, and the kitchen is well appointed to cook if you need/want. The laundry is also very welcome. Overall this is a good affordable place to stay when you need more than a motel room! I stayed here with my 3 kids on our visit to NYC. The apartment is super...really clean and modern, huge refrigerator, good shower and TV. The location is great....just a short walk to the subway, and directly into Manhattan from there. Nicky was an awesome host..great communication in advance to reassure me, and super-helpful with advice whilst we were there. The apartment was super clean and well organized. Nicky was a great host too! Super helpful and good communicator. A baby crib is available to rent upon request for an additional $50 per reservation.